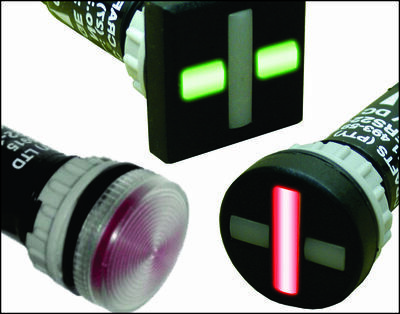 Mimic Components pioneered the use of LED Pilot Lights in South Africa, and with 15 years experience in indicating devices, is well qualified to comment on the practical applications of pilot lights. This guide is biased toward practical applications: Pilot Lights are arranged in order of cut out size. Some lamps are made especially for 30mm but we also offer an adaptor which converts 22mm lamps to 30mm (YADP30 on Pilot Lights (ø22 - ø30mm)). IT IS MOST IMPORTANT TO BEAR IN MIND THE OPERATING VOLTAGE, AS THIS PREDETERMINES THE VARIETY AND TYPE OF PILOT LIGHT TO BE USED. In the lower range (24V) all of our lights are suitable. In the higher range (220V) only selected lights are suitable, due to the large resistors or voltage converters required for LEDs which operate at approx. 2V per chip. We also offer AC/DC (universal AC or DC on the same device) and only DC, so care must be taken in fully specifying the available voltage and current. It is a common misconception that Cluster LEDs need to be paralleled to obtain greater reliability. This is not necessarily so; LEDs in series offer the advantage of reduced power consumption and, in the very remote chance of failure, they usually fall into short circuit and thus the others continue to operate. It is now well accepted that LEDs offer the best illumination / lifetime compromise. They may not be as bright as filaments, but have been found to be very adequate and have a proven reliability 50 times greater than that of filament lamps. LEDs also have a MTBF (Mean Time Between Failure) of approx. 15 years compared with a typical filament bulb MTBF of one month. LEDs consume less power, generate negligible heat, are immune to vibration and can often withstand severe over voltage. Also included is Mimic Crafts Alarm Indicators which are efficient and aesthetically pleasing on operator information panels. These can be made up in configurations to suit almost any requirement. They are the modern way to display important PLC or other information. In many cases they are far superior to pilot lights and labels as the label is an intrinsic part of the indicator.